A perfect springtime melody is nothing short of the luxury of Fresh Cut Lemons. 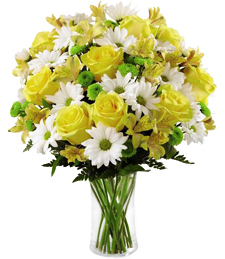 Golden yellow and shimmering white fresh florals add that extra little something to that memorable occasion. Now is the time to ring in that golden season! 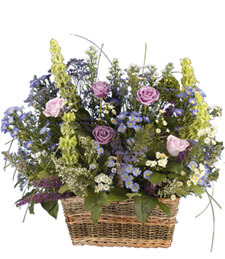 Brimming with beautiful, multicolored flowers in hues of blue, pink, purple and lavender, this array sparkles with natural grace and charismatic charm! 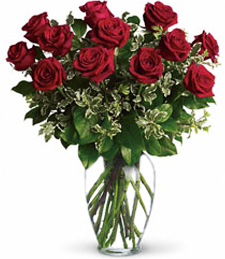 Guaranteed to illuminate any room, these brilliant blooms make a simply splendid gift! 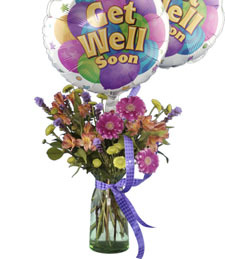 Kick a special someone's health into turbo-mode with this show-stopping arrangement. 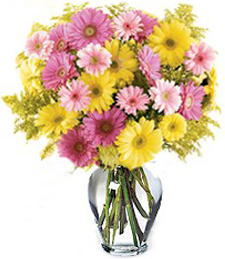 Bountiful and exquisite, this breathtaking bouquet of fresh flowers truly speaks volumes. 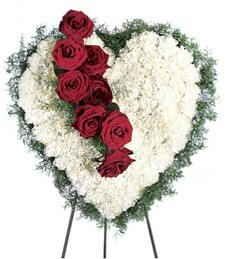 A most poignant and perfect gift! 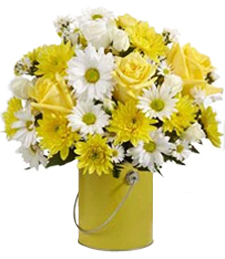 A glorious homage to the pretty power of daisies! 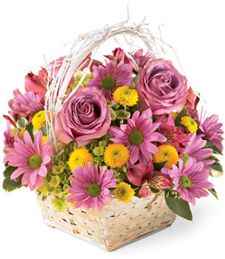 Ravishing and resplendent with vibrant hues and bountiful blossoms, this bouquet is sure to delight all who lay eyes upon its splendid glory. Send today! Savor that taste of invigorating pleaaure with A Hint of Mint. 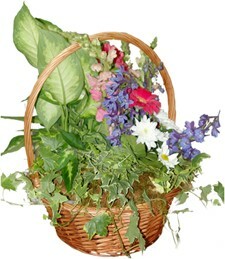 A sweet refreshing aroma travels through the room with an energizing trace of utopia. 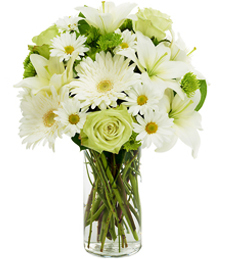 Shimmering white and invigorating green collaborate together for a glistening bouquet of earthy pleasures that highlight any special occasion. 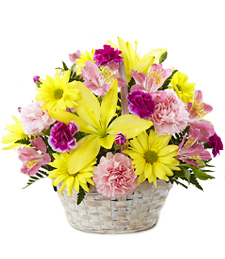 This charming basket overflows with rich, lush greenery and bright, cheerful flowers in hues of yellow and white! 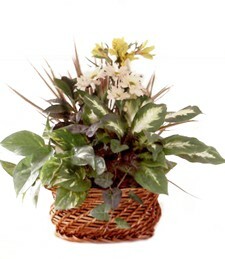 Sure to light up any room with natural charm and charisma, these greens and blooms make a simply splendid gift! Fun, festive, and oh-so fabulous! 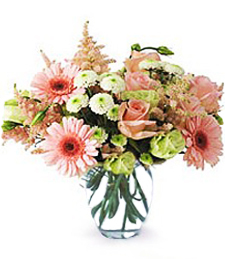 Celebrate the brilliant hues of nature with this glorious arrangement of lovely lavenders, pastel pinks, and darling green and yellow accents. 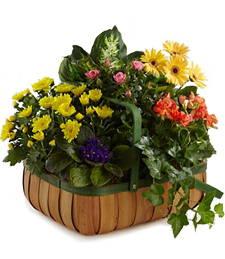 Delight their world--send a basket of flowering glory today! 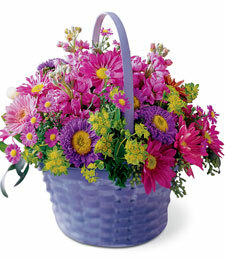 This stunning mix of pink, purple and yellow flowers brims with natural beauty and elegant charm. 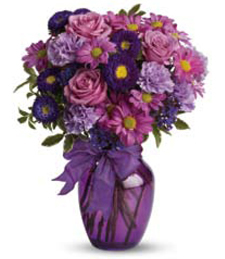 Subtle yet vibrant, these beautiful blooms will light up any room and make for a truly breathtaking gift! 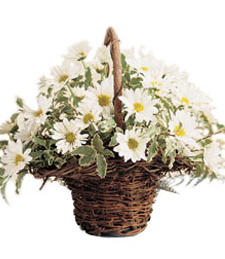 Charming and delightful, this assortment of white daisies overflows from a stylishly rustic basket! 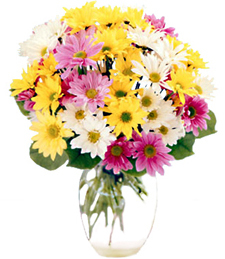 Sure to light up any room with nature's "joie de vivre," these blissful blooms are a truly luminous and smile-inducing gift! 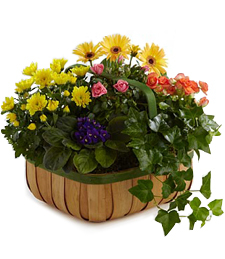 Make the room positively glow with beauty and joy! 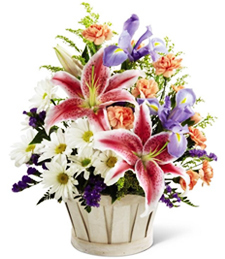 Fresh, becoming, and truly exquisite to behold, this beautiful bouquet truly speaks volumes of delighted glee and wondrous harmony. 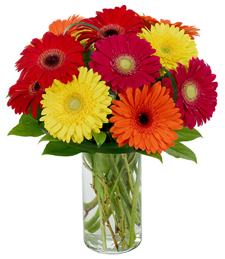 Reign into the new seaosn ahead with a Burst of Gerbera in dazzling hot shades of ravishing red, burnt orange, and sunkissed yellow. 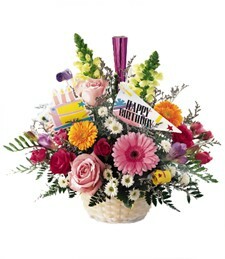 Set the occasion on a new level with a token of vibrant affections for happy every memory counts. 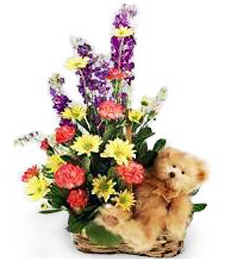 A cuddly bear tucked away in a charming basket of vibrant and fresh springtime flowers. A truly Inspirational and heartwarming gift.